I did something fun last week. I cut some 2 1/2 squares for a friend who is doing a charm quilt. She suggested that I cut some for myself as well. This is what I ended up with: a snapshot of my scrap collection. 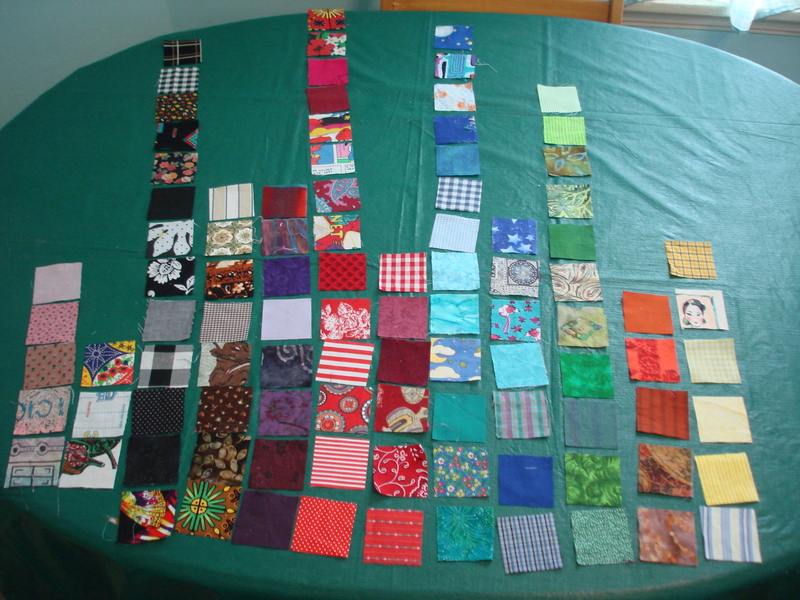 This is every quilting fabric I have in my scraps. To be clear, scraps for me are pieces of fabric that are smaller than a fat quarter. With my awesome organizational skills, I have determined that a fat quarter (give or take a little) is the smallest size that I can neatly fold. So my scraps are stored randomly. 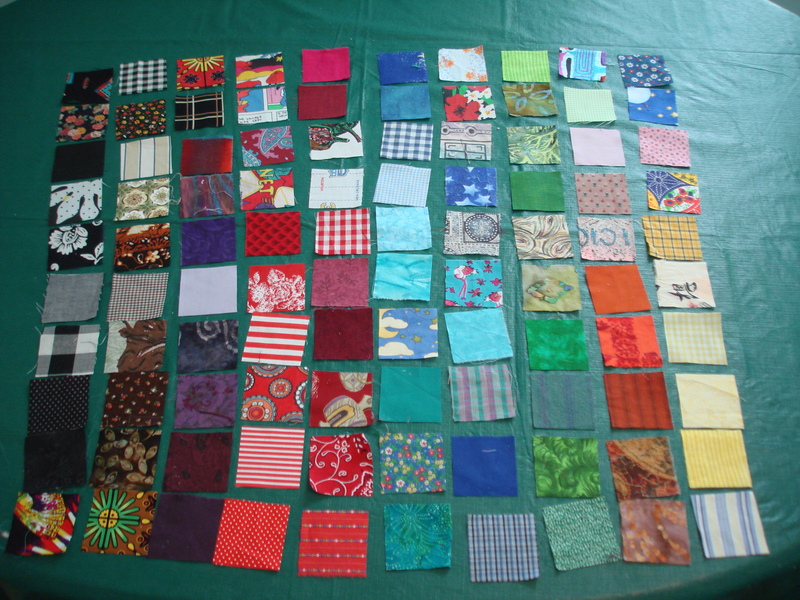 Whenever I start a quilt I go through them and pull all of the colors for that particular quilt. So it turned out I had ninety-nine. So I had include one more from my grandmother stash to make an even hundred. I will use mine for a leader and enders over the next few months. It’s great to look at these little swatches because they are full of such great memories. The yellow plaid one is from a shirt my son had when he was about four. The bright red floral, call it b-7, is from a weird maternity dress I never actually wore. One of the things I love about quiltmaking, is the lines that can be drawn between work. In painting, an artist may have motif that repeat, or a color scheme, but in quiltmaking the fabric can often draw relationships between work. Also, for me personally, the fabric can have great meaning and memory. I love the idea that some of these lines are now drawn across the country to a new completely different line of work. Love your charms! You’re much more ambitious than I…to label them in a photo! Look at all of those 2 1/2 inch memories! It was a good time to look through them all. Thanks for stopping by. It was fun to go through all the fabrics and remember. Thanks for stopping by. Beautiful post! Thank you for sharing your memories with me. Thanks for doing the charm quilt, it was so fun to contribute.